Josh Gordon is an African–American National Football League player in the position of a wide receiver. He was drafted in the 2nd round of the 2012 NFL Draft and has been in the league since then albeit with lots of undesirable things trailing him. Josh is arguably the most banned player in the NFL which is quite surprising to many considering how good he is. The question has always been why can’t he put drugs aside and focus on being the best wide receiver he can be. Find out how he’s doing so far and much longer it is expected that he would last in the NFL if he does not drop the drug use. Josh was born in Houston, Texas in the United States on the 13th day of April 1991 as Joshua Caleb Gordons to parents Elaine and Herald Gordon. He is known to have two brothers but their names are not known. Apparently, the footballer likes to keep his personal affairs private and prefers to discuss only his career at interviews. Nonetheless, we know for certain that he is of Haitian ancestry. Growing up, Josh went to Lamar High School where he ran track, played football and basketball. As an athlete, he competed in the 4 by 100m and 4 by 200m relay races for which he won state titles in both events recording 42.69 secs and 1:30:40 mins respectively. As a Junior student playing football, he caught 20 passes for 363 yards and 4 touchdowns, while as a Senior he caught a total of 25 pass receptions for 531 yards and 9 touchdowns. Due to this achievements, he was highly sought by well-known institutions like Baylor University, Kansas University, Missouri University, Nebraska University, and Texas Tech. Josh Gordon was considered a 3-star recruit by Rivals.com and was rated 2-star by scout.com. In his second year in October 2010, while in the company of fellow teammate Willie Jefferson, local police found them asleep in a drive-through in a local Taco Bell. The footballers had marijuana in the car and for that reason, Gordon was suspended since it was only his first team rule violation. He soon got an indefinite suspension following a failed drug test when he tested positive for marijuana. He then transferred to the University of Utah where he completed the 2011 season and subsequently declared for the 2011 Supplemental Draft. Josh Gordon was picked by the Cleveland Browns in the 2nd round of the 2012 supplementary draft. He then signed a 4-year deal worth 5.3 million dollars with the team and scored his first career touchdown against the New York Giants. In his first season with his new team, he recorded 50 catches, 805 yards, and 5 touchdowns in 2012. By the next year season, his school days drug problems surfaced and saw him suspended for using a drug enhancer- a direct violation of the NFL’s drug policy. Although, in week 12 of the 2013 season, he made history in the NFL as a wide receiver with 200 plus receiving yards minimum for back to back games. He was also the Cleveland Chapter PFWA Player of the Year 2013 and by December, he got his first Pro Bowl selection and finished up that season with a league-leading 1,646 receiving yards to clinch the All-Pro title. Gordon’s woes surfaced again at the beginning of the 2014 season when he got arrested for driving while impaired and was again suspended for contravening NFL’s substance policy. After appeals, the suspension time was reduced by NFL to 10 games only which meant that he played only 5 games in the 2014 season. The 2015 season was not any better as he was again found wanting because he tested positive for alcohol and performance-enhancing drugs, which led to him getting the hammer for a full season this time. Although he appealed to the NFL league, that appeal was denied because he failed the condition attached to his appeal. However, he was allowed to participate in the training with his team. His abuse and consistent use of banned substances as regulated by the NFL was to no end as in 2017 he was yet again on NFL’s blacklist for failing the test. Nevertheless, he was allowed back to the games at the 13th week of the 2017 season after he fulfilled some conditions given to him by the NFL body. He finally scored a touchdown in the game against the Packers in December 2017 though his team lost that match with 9 points off. 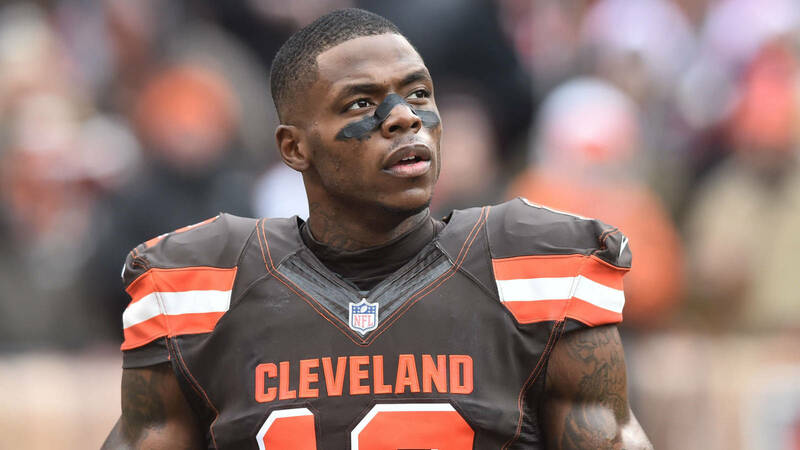 During the 2018 7th draft pick for 2019, The Cleveland Browns traded Josh Gordon to The New England Patriots, he will be joining new teammates Tom Brady and Rob Gronkowski. According to NFL career statistics for 2012 to 2018, Josh had played in a total of 41 games. Under Receiving, he totaled 180 receiving, 3,106 yards, 17.3 average, 75.8 yards per game, 95 longest interception returns, 16 touchdowns, 50 (20+), 13 (40+), 13.3 (1st) and 1 fumble. Under Rushing, he totaled 5 attempts, 0.1 attempt per game, 88 yards, 17.6 average, 2.1-yard games, 34 Longest interception returns, 4 (1st), 80.0 (1st%) and 3(20+). Under Passing, he was rated 39.6 and under fumbles, he recorded 1 fumble and 1 lost fumble. Currently, Josh Gordon’s career earnings are estimated to be worth $6.08 million, for over five seasons. His salary per annum is estimated to be worth 1.3 million dollars. He ranks 55th on New England Patriots active roster with a cap hit of 697 thousand dollars for 2018. Josh is a tall man standing at a height of about 6 feet 3 inches, supported by a weight of about 102kg, his arm length is said to be 0.82m with a hand size is estimated to be 0.25m.